3 crews from each team (each crew using its own IFV). Separate with 1-2 min gap (4 IFVs on the race at once). 1st lap — automatic gun firing (target #14 "Infantry Fighting Vehicle"). 2nd lap — automatic gun firing (target #25 "Helicopter"). 3rd lap — coaxial MG firing (target #9 "AT Grenade Launcher"). Race results of each IFV crew are counted by summing total distance time and penalties. Twelve top teams in the individual race are to compete in semi-finals (Relay race stage). Each crew to run 4 middle laps (3-5 km) crossing the obstacles and engaging targets on three firing lines. Automatic gun firing at short halt on target #14 and at halt on target #25; coaxial MG firing at halt. Firing sessions sequence: during the Relay race to be done due the order established by the draw procedure. 3 rotating crews from each team using only one IFV. 4th lap — automatic gun flank firing at short halts on three targets #14. 2nd lap — speed race. 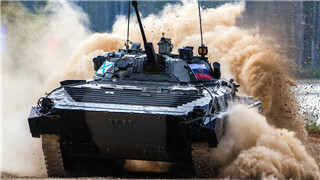 The results of IFV crews' performances are counted by summing up total distance time with obstacles and firing sessions' scores. Each place in rating is the score obtained on the route by each crew. The winner of the contest for IFV crews is the crew obtained top scores in the first stage. A team contest winner is the Relay race winner. Any breach of the obstacle crossing rules will cause penalty scores, firing sessions' misses and safety regulation breaches will cause penalty laps. Penalty scores during the run shall be summed up and every 60 penalty scores will cause one penalty lap. The crew will be disqualified and placed to the last place in rating of the current competition stage for pointing the gun barrel or MG towards the tribunes, dismounting without the command of the chief Judge. The crew that causes a collision of tanks on the route will be disqualified and placed to the last place in the current Competition stage. The winners in the individual contest among BMP-2 crews are awarded medals for the 1st, 2nd and 3rd places. The teams are awarded medals for the 1st, 2nd and 3rd places and winner's cup in the Relay race. "Tracked passage in the minefield"
for driving without speed decreasing to 5 km per hour in 5-10 m before the escarp. for touching the limiting pylons while entering or exiting the water obstacles or while stopping in water. for every touched pole (obstacle) while doing the S-turn and each missed passage between the poles (buoys).